On the whole, the Galileans are said to have been strict in their religious observances (M. Ḳ. 23a; Pes. 55a; Yer. R. H. iv. 6; Yer. Soṭah ix. 10). 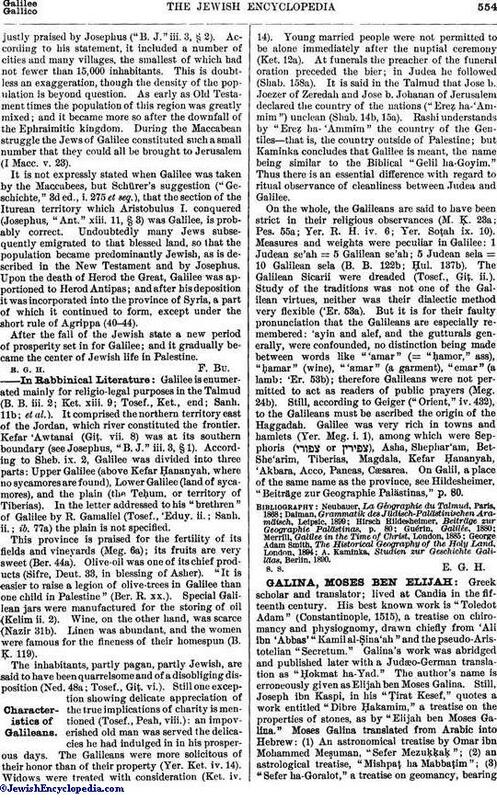 Measures and weights were peculiar in Galilee: 1 Judean se'ah = 5 Galilean se'ah; 5 Judean sela = 10 Galilean sela (B. B. 122b; Ḥul. 137b). The Galilean Sicarii were dreaded (Tosef., Giṭ. ii.). Study of the traditions was not one of the Galilean virtues, neither was their dialectic method very flexible ('Er. 53a). But it is for their faulty pronunciation that the Galileans are especially remembered: 'ayin and alef, and the gutturals generally, were confounded, no distinction being made between words like '"amar" (= "ḥamor," uss), "ḥamar" (wine), "'amar" (a garment), "emar" (a lamb: 'Er. 53b); therefore Galileans were not permitted to act as readers of public prayers (Meg. 24b). Still, according to Geiger ("Orient," iv. 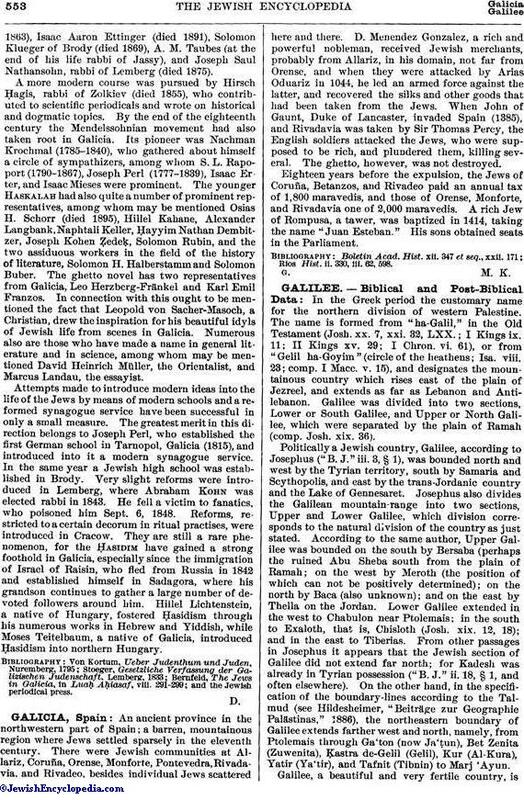 432), to the Galileans must be ascribed the origin of the Haggadah. Galilee was very rich in towns and hamlets (Yer. Meg. i. 1), among which were Sepphoris ( or ) Asha, Shephar'am, BetShe'arim, Tiberias, Magdala, Kefar Ḥananyah, 'Akbara, Acco, Paneas, Cæsarea. On Galil, a place of the same name as the province, see Hildesheimer, "Beiträge zur Geographic Palästinas," P. 80.